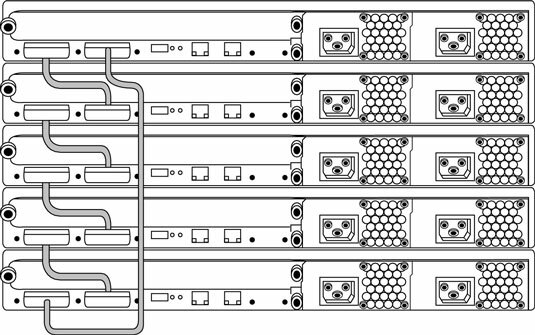 When you want to create a Virtual Chassis unit from two or more (up to ten) EX series switches, you normally interconnect them using the dedicated 64-Gbps Virtual Chassis ports (VCPs) on the back of the switch chassis, which are designed exclusively for interconnecting switches (and which require no extra configuration on the switch). You can also interconnect two or more EX switches using the 10-Gbps ports on the uplink module, but then you must configure these ports to be Virtual Chassis Extender Ports (VCEPs). In the shipping box of each EX model that supports Virtual Chassis, you will find one Virtual Chassis cable for the dedicated 64-Gbps VCPs. The Virtual Chassis unit you create can be in a single rack or wiring closet, or it can be spread out across different racks or different wiring closets. The only restriction on where you can place the switches is the maximum length of the VCP cable, which is about ten feet (three meters). If you need a longer distance, you must connect the switches by configuring ports on the 10-Gbps uplink module to be VCEPs. You can use both VCPs and VCEPs in a single Virtual Chassis unit, if necessary. Design the connections between the individual chassis to form a ring topology that ensures that the distance between any two switches in the Virtual Chassis unit is as short as possible. A ring topology configuration provides up to 128 Gbps of bandwidth between member switches, which they use to pass data packets and out-of-band traffic. EX 4200 switches connected in a ring topology. When you’re connecting member switches that are in adjacent racks or in wiring closets scattered across a floor in your building or between floors, using a chain topology that joins each member switch to the previous and next switch in a line is often easier than trying to loop back to form a ring topology. The maximum bandwidth between member switches in a chain is slower than that in a ring, only 64 Gbps. Additionally, this topology provides no redundancy in case of a switch or link failure in the middle of the chain. For that reason, you should try to form a loop wherever possible. EX 4200 switches connected in a chain topology. Not all EX Series models support the Virtual Chassis feature.